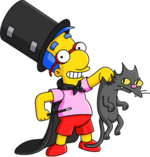 Milhouse Mussolini Van Houten (born July 4th) is Bart Simpson's best friend. 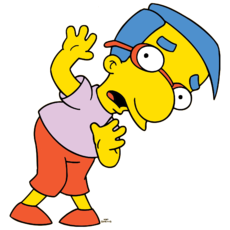 As the only child of Kirk and Luann Van Houten, Milhouse's most distinctive physical traits are his extreme nearsightedness (depicted by very small eyes), requiring thick glasses to correct, and a large potato-shaped nose. 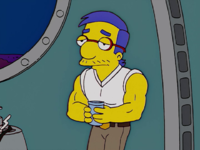 Milhouse has his mother's coloring (blue hair) but not her vivacity or confidence, and shares his father's generally milquetoast and defeated demeanor, although Milhouse sometimes gets cocky and overconfident, raising his eyebrows lasciviously, usually while trying to woo Lisa. Despite being considered a nerd, Milhouse is of average intelligence but has poor social skills. He is also very gullible, thus he is constantly led into trouble by the mischievous Bart, who is not shy about taking advantage of his naive, trusting and loyal friend, although occasionally Milhouse takes advantage of Bart. On one occasion, Bart got Milhouse placed on the America's Most Wanted list, even though they are friends, and he once tried to lure Milhouse into a cactus. This kind of torture is often used by Bart, who tries either to get Milhouse in trouble or to hurt him for no reason, making Milhouse's and Bart's relationship even more questionable. Bart once introduced Milhouse and attempted to explain why they are friends. He cannot come up with a real answer and admits that it is due to geographical reasons, though Bart has admitted that he really loves Milhouse. Homer often calls Milhouse a "doofus" or refers to him as "that little wiener Milhouse". Homer also called Kirk Van Houten a "weirdo" and once emailed him to "pick up your weirdo kid". Bart does genuinely care for Milhouse, despite victimizing him on many occasions. 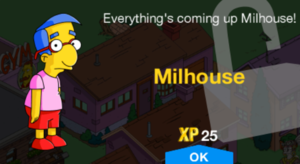 Milhouse often does bad things under Bart's influence, like dropping mustard on cars from the top of a bridge and destroying the school by loosening all the screws. 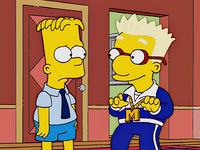 This is the reason his mother, Luann, at one point didn't want Milhouse to see Bart anymore, but later changed her mind after Marge talked to her. Milhouse has been seen as a cool boy on some occasions. When his parents were presumed lost at sea (they were later found safe) during their second honeymoon, Milhouse acquired a somber gravitas. The kids at school were impressed, even Nelson, who forewent giving Milhouse his scheduled wedgie. Bart brought Milhouse's uncle, Norbert to Springfield to console Milhouse. Once Milhouse was no longer (believed to be) an orphan, however, the other kids went back to treating him as before. Later, when his he and his mother moved to Capital City, he dyed his hair blond, wore loud clothing, and treated the visiting Bart poorly to impress his new city friends. He even gave Bart a wedgie (Bart allowed it). Later his father won a judgment requiring Milhouse to be returned to Springfield. Milhouse has exhibited a tendency to act feminine, complete with dress, clichéd catchphrases and mannerisms, usually in some sort of misguided or out-of-control shenanigans, luring Bart, on at least one occasion, to dress likewise. His lies and social anxiety have cost him Lisa's affection three times, as well as a relationship with Rainier Wolfcastle's daughter Greta. Examples of such behavior are referring to himself as a "big sister" and being caught with a scrunchie in his hair. Milhouse may have a crush on Marge, implied when Bart asked him if he's in love with her. Additionally, upon being asked whether he thinks that Marge is cool, he immediately, without thinking, responds, "No, I think she's HOT!" Lisa once showed concern for Milhouse when he was beaten by Nelson and left in a heap, and tended to him. However, she soon became distracted by the arrival of Irish environmentalist Colin, who became her love interest. When the Trappuccino finished, Milhouse lied to Lisa about Colin's death and claimed he begged Milhouse to look after her. Colin returned in the middle of Milhouse's story, and Milhouse quickly took his leave. 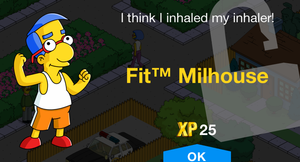 A few years later Milhouse (having lost the "Hulk"ish physique) and asks Lisa to marry him. She declines because she believes she never wants to marry. 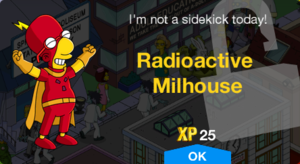 At age 25, Milhouse is balding and works as Homer's supervisor at the Springfield Nuclear Power Plant. He abuses the position to mistreat Homer when learns that Lisa is engaged to another man, although it ultimately does not last. At age 40, he marries Lisa; the two have a teenage daughter, Zia. 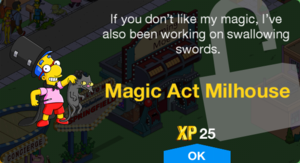 Milhouse appears as the villain "Mr. Dirt" who taunts Homer and Lisa as they seek to defeat all three Sparklemons. 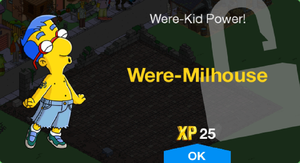 After they capture all three Sparklemon balls and place them in the coin slots of the giant toilet shrine, Mr. Sparkle cleans up the village, and Milhouse shrinks to normal, handing over the keycard and being attacked by the three Sparklemons. Modified on April 23, 2019, at 09:13.